Designers and Developers for Automotive Projects. HMI user experience design & connected car apps. Award-winning vendor trusted by the leading OEMs worldwide. Bamboo Apps’ designers, engineers, agile coaches are continuously delivering new features and improvements for JLR’s InControl Remote system. Škoda LittleDriver is an interactive game that is designed to teach kids driving basics. It is SmartGate and SmartLink+ app that allows passengers to reproduce the driver behavior. Team Leader - Electronics Development - Connectivity at Škoda Auto a.s.
We work with OEMs and Tier 1 automotive suppliers side by side on designing, developing, implementing, and improving securely connected solutions. We deliver connected car apps serving as a communication bridge between a car manufacturer and infrastructure, also between a driver and a car itself. We build applications for in-vehicle infotainment (IVI) systems to entertain and inform drivers and passengers and ensure convenient usage of their mobile devices. Bamboo Apps has niche expertise in designing embedded apps offering helpful driving and entertainment information on Human Machine Interfaces. We developed an in-depth approach to automotive cybersecurity that brings together multi-layer solutions, components, and techniques. Bamboo Apps has long-term collaborations with clients serving them as a dedicated development team as well as working under outstaffing model. We provide full-cycle custom software development and R&D services for automotive and mobility industry. Drop us a line about your project and our specialist will get in touch with you within 24 hours. 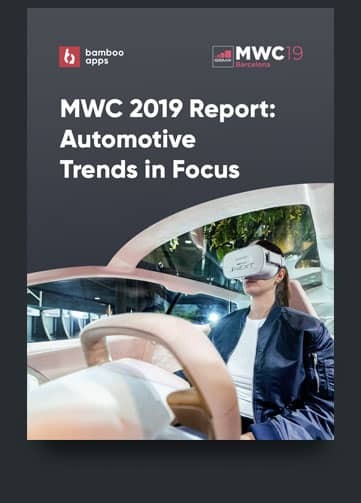 Major automotive tech trends and innovations that were presented at the MWC'19. Biggest events in the automotive & mobility industry we attend.